Many thanks to the multi-talented moms that have shared their baby's nautical nursery pictures with us; we salute you! Your nursery ideas are amazing and it is most appreciated that you have taken the time to share the details of how you put their baby's room together. We appreciate the time that it took to tell us where you bought your decorations or craft supplies for any part of the project that was DIY ed or made yourself. Your efforts make things so much easier for the rest of us. You have been most generous with your time and I hope that our visitors will take a moment to leave a comment to say how much they admire your work. Your love-driven decorating skills certainly raise the bar for the rest of us. Without the tips, pointers and shopping resources shared, it would be very easy to get bogged down and lost in the details. 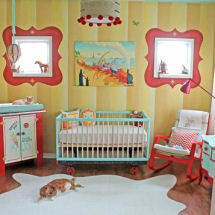 Be prepared to be wowed, when you take a look at their concept of nautical nursery themes in the photo gallery. The clever use of lighthouses, whales and sailboats in the nautical nursery pictures on display there reflects each individual's love of the ocean and their own favorite seashore from Cape Cod to a remote Caribbean island. 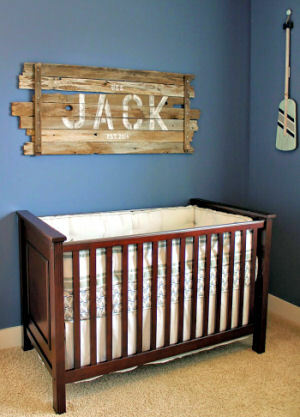 There is also a place for vintage items in nautical theme nurseries that add a rustic charm to the space. Items collected over the years find a place on the walls where they can be appreciated by the family as well as visitors who come to admire the new baby. 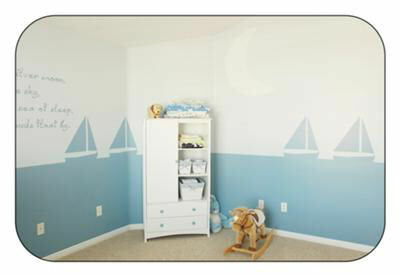 See more pictures of this baby boy's nautical nursery theme here. The uses they have found for ordinary stuff that I would never dream of using as sailboat theme nursery decorations are going to blow your mind and send your baby boy's or girl's nursery sailing on its way to perfection. Do you have a great set of baby bedding or a picture of a nursery that you decorated in a jungle theme? Share it! Let the moms know that you enjoyed their photos by leaving a comment in the section provided below by Unique Baby Gear Ideas. If you have any questions on how to decorate a sailboat or nautical themed nursery, you are welcome to leave your questions as well.